Parallel parking is a nuisance for newly licensed and veteran drivers everywhere. Someone took notice of this issue and looked towards technology for a solution. As cars got larger and parking spaces got smaller, the “problem” of parallel parking increased. In the early 1930’s, Brooks Walker created a new elaborate solution for parallel parking by developing a fifth wheel solely designated for parking. This auxiliary wheel is hidden in a vehicle’s trunk and pushed down to the ground by hydraulic pumps and gears when needed. With a simple crank on the dashboard, the wheel would be lowered to the ground and swing the car around for easier parking. After the car is in its parking place, another switch would lower the car back into its original position. The patent for this idea was filed by Walker on March 21st, 1932 and granted on December 6th of the same year. The patent describes the intricacies of the fifth wheel within the vehicle and its function. 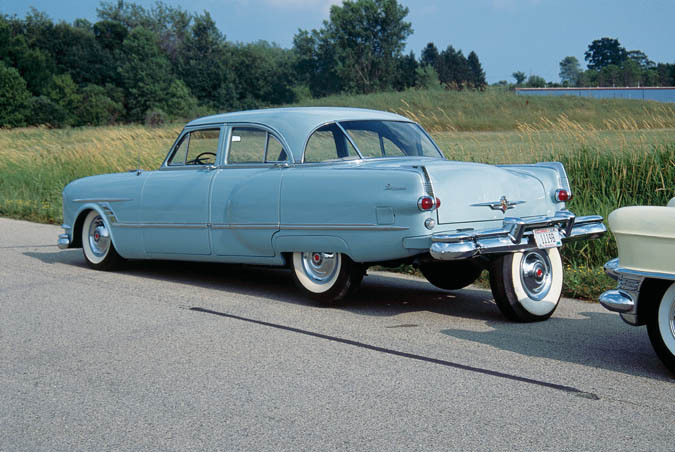 Several years later, Walker decided to modify a Packard Cavalier in 1953 to showcase his prototype to the world. The Packard represented luxury and appealed to the upper class. It was possible that Walker wanted to use this car and demographic to demonstrate how easy the system is to use and how anyone can be comfortable using it. All the driver had to do was flip switches on the dashboard. Walker went on to display his innovation at various auto shows throughout the years. However, his novel concept was not received as successfully as he hoped. High production costs and the lack of trunk space led to his idea being shot down. His forward-thinking parking solution was not implemented on a large scale. His vision of easier parking has been achieved by the self-parking cars today. Photo taken from an issue of Life Magazine published in 1952. Walker’s Packard Cavalier prototype (Above).